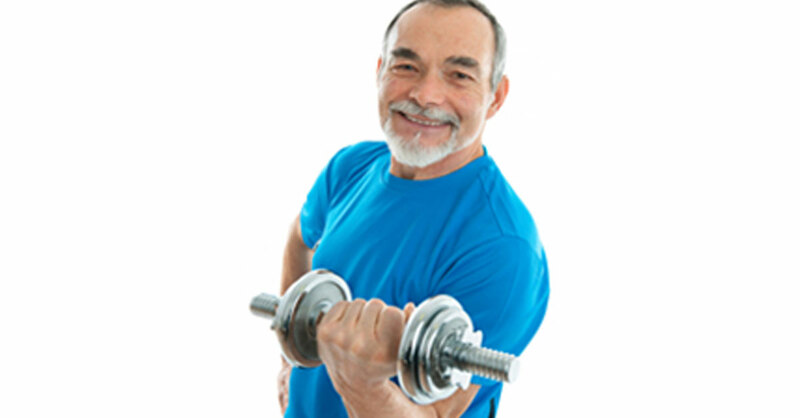 Lifting weights to build muscle can, of course, help us stay more fit and healthy as we age. But a typical strength-training routine using heavy weights can be risky for people with orthopedic problems, such as arthritis, back pain or sports injuries, and for people with other conditions, such as glaucoma or high blood pressure. And some people just don’t enjoy lifting heavy weights at all. So I’m energized by new research that suggests that lifting light weights can help build strength just as effectively as heavy weights—as long as you do the exercises in a certain way. To figure all this out, researchers analyzed how different weight loads and repetitions affected the quadriceps muscles in subjects’ thighs. First, they assessed each subject’s “maximum load capacity” (MLC, the largest amount that each subject could push with the legs using a weight-resistance machine). Then each subject did three sets of this leg exercise three days a week at either 80% of his MLC or 30% of his MLC—in other words, with weight that seemed heavy or with weight that seemed light. Each set lasted until the participant’s legs pooped out—generally after doing the exercise about 10 times with the heavier weight or 30 times with the lighter weight. Results: Both groups pushed about 30% more weight by the end of the 10-week study, meaning that their muscles became about 30% stronger. In other words, doing lots of reps with a lighter weight built strength just as successfully as doing a few reps with bigger loads. Lifting lighter weights more times won’t be any easier—you’ll still feel tired after a full set—but the load on your muscles, joints and cardiovascular system will be lighter, and so there’s less chance of straining a muscle, injuring a joint or worsening a health condition, said lead researcher Cameron Mitchell, a PhD student in kinesiology at McMaster University in Ontario. The secret to achieving similar results lies in how you lift a lighter weight, Mitchell added. The idea is to lift and lower it until you’re at the point of real muscle fatigue—where you can no longer maintain proper form. Mitchell offered an easy rule of thumb to figure out your personal MLC—a 30% load can be lifted between 25 and 35 times, while an 80% load can be lifted between eight and 12 times. So if lifting heavy weights isn’t recommended for you because of your health condition, ask your doctor if it’s OK to try lifting only lighter weights that you can do about 25 to 35 reps with. Complete three sets during your routine for each muscle that you’re trying to build, and do this routine two or three times a week with at least one rest day in between. While only quadriceps muscles were tested in this study, Mitchell told me that there’s no reason to believe that the same results can’t be achieved using a weight machine, dumbbells or barbells—or heck, even soup cans—on any muscle that you want to strengthen.